No one who achieves success does so without the help of others and that’s why we love to read The George Wraysbury reviews. It’s our guests – whether regulars or new to our venue who help spread the word about our English gastropub where we serve morning coffee, fabulous lunches including menu specials, afternoon tea that’s just perfect for a spring day and delicious supper selections, created by our own chefs using fresh vegatables, herbs and fruits gathered from our own pub garden. We thank you for your emails, blogs, reviews and general kind words that you offer to us on a daily basis. Without you, we would not be where we are today. Have you visited The George at Wraysbury and would like to leave your review? You can use the share buttons at the bottom of this page or add your review on Trip Advisor. The George was reopened after a sympathetic refurbishment that maintained many of the old features and character of this 600 year old building and has become one of the most popular gastro pubs in the Windsor and surrounding area. The George makes everyone welcome whether you’re a local resident of Wraysbury, live in Windsor and the surrounding area or are just passing through. With The Queen Mother Reservoir, Magna Carta, Wraysbury on Thames and The Yew Tree providing popular local attractions, The George is accustomed to welcoming guests throughout the week and without a reservation in need of a hot, hearty meal both lunchtime and evening. For weekend dining we recommend a reservation as our restaurant is often booked 1 week in advance. We also welcome dog walkers to our lounge bar where during winter time, a roaring fire awaits with plenty of fresh water for your exhausted pooch! Our visitors are fond of relaxing in The Olive Garden a spacious, sunny and secluded area to the rear of our building and adjacent to The Boxers Barn where legendary Henry Cooper used to train with his brother. The George serves an impressive selection of drinks from every corner of the world including a selection of both local and international beers and wines. Have you visited our sister pub The Spring Inn Sulhamstead? 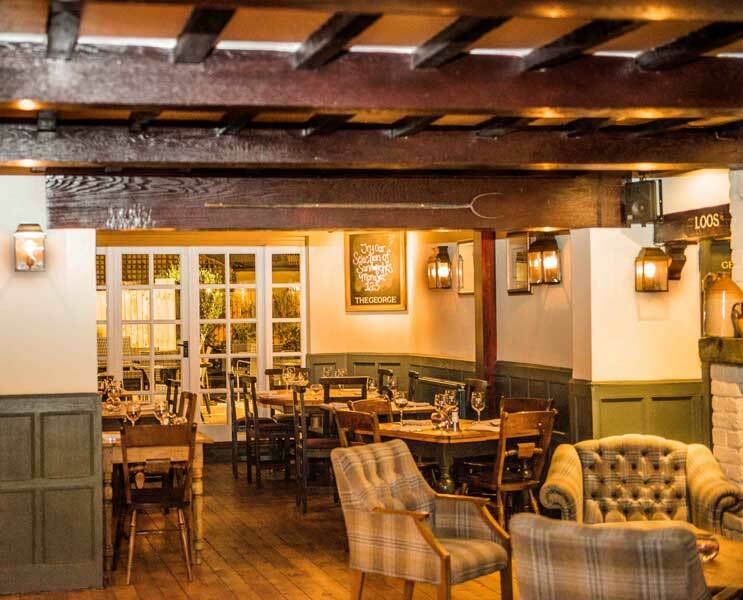 Click HERE to find out more about our equally welcoming English gastropub located in a beautiful rural setting just along the A4 and close to Reading, Berkshire. For bookings and other enquiries please email The George. Love To Stay In Touch?